GRILLED CHEESE IN THE OVEN RECIPE – LARGE FAMILY STYLE! One of the easiest and yummiest sandwiches has got to be the old-fashioned grilled cheese. Melted, gooey cheese; hot toasted bread; lots and lots of butter…what could be wrong about that?? Grilled cheese sandwiches are always a hit around here with my large crew, but making enough sandwiches for all of us with my electric skillet takes quite a while. I can typically make around 8 at a time on there, so somebody is always waiting for theirs to get done. So a while back, I started making my grilled cheeses in my oven. And it’s so easy, I’ll never go back! They get just as crispy and yummy in the oven as they do on the stove-top or skillet. 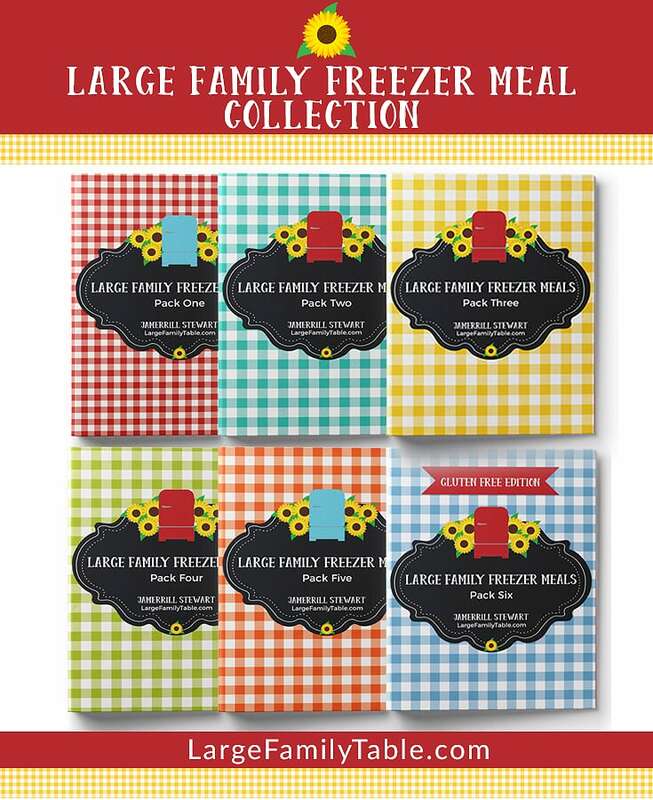 And you can prep these ahead of time for the freezer. 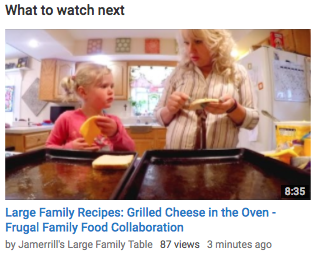 Miss Amelia and I share how we do our grilled cheese in the oven recipe as part of our collaboration with Frugal Family Food! We made two loaves worth and had about 8 sandwiches left over for the following day. I don’t know how to function without leftovers 🙂 Amelia is especially cute and helpful in this video. So when I make them now, I make a few with mayo and a few without. Just biting into that hot, gooey, cheesy goodness with that slather of mayo inside takes me right back and makes me want some tomato soup to go with. Yum. Hot, crispy, and gooey deliciousness straight out of the oven. Preheat your oven to 450*. Butter one side of bread and place butter side down on pan. Layer cheese on top of bread. Butter one side on another piece of bread and place butter side up on top of cheese. Turn sandwiches over to bake other side. You know your oven best, so watch the sandwiches and turn when they are brown and crisp. Use whatever kind of bread your family prefers (I used wheat bread from WalMart), and however many slices you need to make the appropriate amount of sandwiches for your crew. I like to use 2 slices of cheese per sandwich; do what suits your family. And don’t forget the mayo!! See how easy?! This is a perfect recipe to have one of your little ones help with. I loved having Miss Amelia by my side to help me put these together. This would be a great recipe to start your beginning cooks out with as well. You might need to do the hot oven part, but they can put them together all by themselves. 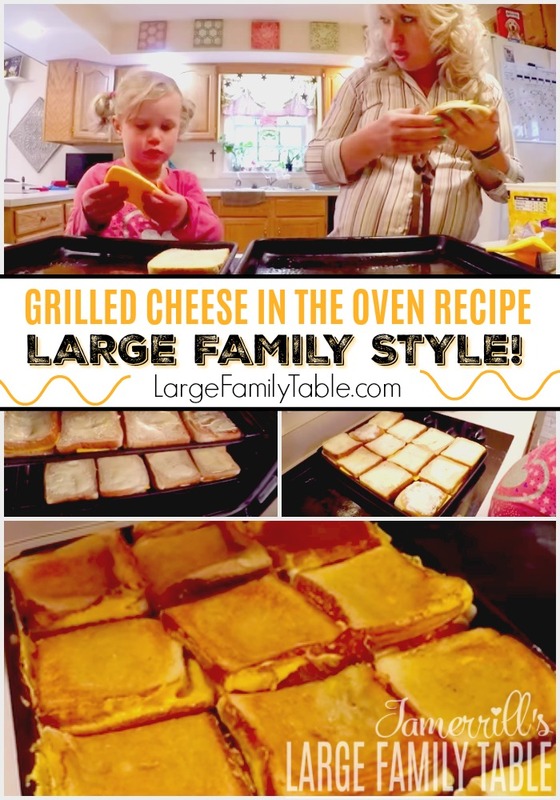 Click here to watch the full GRILLED CHEESE IN THE OVEN RECIPE – LARGE FAMILY STYLE! Tell me your preference in the comments! I used this method just last night to make Reuben sandwiches for a crowd. Such a timesaver! Thanks so much. We actually use mayo in place of the butter when we make grilled cheese – so yummy! It crisps up better than butter, I find. I wonder if it would be the same in the oven, I’ll have to try it next time. This is such a good tip, don’t know why I didn’t think of it – this way, everyone can have their grilled cheese at the same temp at the same time :).